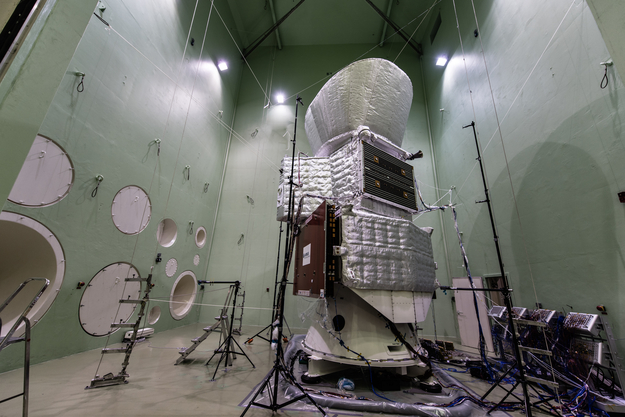 The full BepiColombo stack seen in the Large European Acoustic Facility (LEAF) at ESA's test centre in June 2017. The walls of the chamber are fitted with powerful speakers that reproduce the noise during launch. From bottom to top: the Mercury Transfer Module (seen with one folded solar array to the left, including protective cover), the Mercury Planetary Orbiter (with the radiator seen towards the right), and the sunshield (top), within which sits the Mercury Magnetospheric Orbiter.